Elites Versus The Working Class? The Truth is………….. Ahead of them they face a gruelling 33 hours journey back to London after being stranded in Thailand during the siege of the airports by anti-government demonstrators. The Britons, some frustrated, some angry, and others ‘just going with the flow’ having enjoyed some extra days holiday, set off from Bangkok today to board BA1010, a Boeing 777 which has been flown out to the southern island of Phuket. 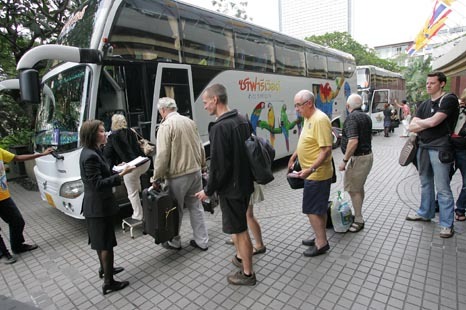 The passengers checked in for flight at special desks set up at the Bangkok Shangri-La hotel and then boarded buses for the ten hour journey south to Phuket. From there they will join 72 and depart at 4am Friday, and fly first to Chennai (Madras) and on to London arriving shortly after 2.10 pm. A retired army colonel, from Stratford-on-Avon,who asked not to be named as he was doing security work for the U.N. in Laos, smiled chuckled to himself before boarding one of the buses said: ‘A good quartermaster sergeant major could have sorted this out in no time. He would have got the transport by hook or by crook. Paul Wicks, 24, travelling with his girlfriend Rebecca Cavaliero,23, both from Guildford, Surrey said: ‘The waiting has not been bad. We have been in a good hotel and our room and food has been paid for. Barry Parkinson, 55, from Barnard Castle, Durham, agreed. ‘Our hotel was getting quieter by the hour too. We are retired and not so much in a hurry, we have just been going with the flow, but Brits certainly seem to be the last out of this mess. Geoffrey Hyde, 54, from Eastbourne, a carpenter , was worried about the dog he had left his kennels and his job. ‘I have taken unpaid lead and was due back at work this week. There has been a lot of confusion. The BA office was shut at the weekend. I hit the roof and my wife was crying earlier when the airline later told us we could not go home until December 10th. Luckily the situation changed’. Adam Brooks, 18, and Jessica Bilton, also 18, both from Nottingham, were not so lucky. Although they joined the busses to Phuket they were told they would have to fly to Singapore and wait another day for a flight from there. Both British Airways and the Foreign Office have been criticised for not coming to the aid of the Britons. Both have vehemently denied the allegations. Other airlines including Holland’s KLM, Italy’s Alitalia, France’s Air France, four airlines from China, and military aircraft from Spain had got their country nationals out of Thailand. But British Airways refused to fly in. The Chinese are reported to have evacuated all their stranded citizens by December 1st. He said afterwards: ‘ We have got 900 of our passengers out of Thailand already. We have charted Jet Star airways to fly to Singapore and also charted Malaysian Airlines for a relief aircraft to join our flights in Singapore. Our foremost consideration was for the safety and security of our passengers. ‘Our office was open during the weekend, but unfortunately the answer phone message said we were closed. ‘If callers had hung on they would have heard an addition to the message especially for stranded passengers.’ He said British Airways hoped to be flying to Bangkok again within days. Meanwhile stranded tourists flying out from U-Tapao airport in eastern Thailand, a former US airbase for B52s during the Indo-China war, were being entertained by live bands and a transvestite show, as the Thais, fearful for their tourism industry encourages them to come back again. They are also being given free food, drink and orchids. All parties in Thailand have agreed to end demonstrations until after the birthday of King Adulyadej on December 5th.